Welcome to the MS Weekly Lottery! Playing our lottery is a fun and exciting way to help change the future of MS and be in with a chance to win amazing prizes. For every £1 entry we’ll allocate you a unique 6-digit number. Match three or more numbers and win one of our great cash prizes between £5 and £1,000. If you match all six numbers, you’ll win an incredible £10,000! You can play £1, £2 or £3 per week for more chances of winning. Simply click the “Enter now” button to join by Direct Debit and ensure you never miss a draw. There is no need to claim as we will write to you if you win and pay any winnings directly to your bank account – easy! 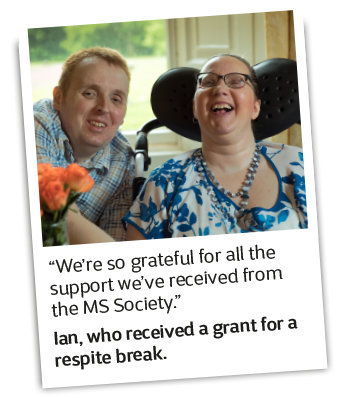 By joining the MS Weekly Lottery you’ll help support our campaigns and services for people affected by MS, and fund ground-breaking research to, one day, stop MS for good. With every entry, you will help change the life of people like Ian and Michelle. Thank you for your support – and good luck! Multiple Sclerosis Society is a charity registered in England and Wales (1139257) and in Scotland (SC041990).